1. A rotating column of air ranging in width from a few yards to more than a mile and whirling at destructively high speeds, usually accompanied by a funnel-shaped downward extension of a cumulonimbus cloud. If you have been affected by a disaster, you can use this page to post “safe and well messages” that your loved ones can view. Registering yourself on the Safe and Well Web site is completely voluntary and you can update your entry at any time. Those searching on this site for your information will need to enter your name, along with your address or phone number. They came in a swarm: A raging storm of tornadoes ran across Tornado Alley on Sunday, May 4, 2003. We don’t know all the reasons a tornado forms, but scientists have a general idea of the weather ingredients that need to come together. Tornadoes are nature’s most violent storms. Tornadoes must always be taken seriously. Tornadoes can be very dangerous — sometimes even deadly. There are many sites with tornado data, so we are giving the subject a little different twist, with tornado myths, tornado oddities, personal experiences, tornado chasing, tornado safety, and tornadoes in the past as well as more recent tornadoes. Why do some thunderstorms produce violent tornadoes while most do not? The answer is related to the wind. 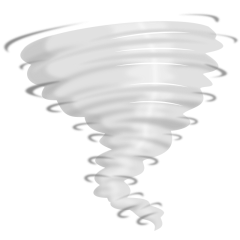 This is Part I of a three part series about Tornado Safety for grades K-4 from the National Oceanic and Atmospheric Administration. GetPart 2 and Part 3 here. More weather lessons like this. Activity book to help children prepare for a disaster. Explains the severity scale. Illustrated with photo for each level. Two working models of tornadoes you can build. One requires dry ice, so adult should be present. Simple demonstration for small children. Our first attempt at making a tornado machine used an updraft fan only with a pan of steaming water to make the tornado visible. We weren’t able to make a vortex this way so we revised our model to use two fans, one on the side and one for an updraft. This simple tutorial is an easy step by step guide on how to draw a tornado. Video stops so you can catch up with your own drawing. Start with a tall, up-side-down triangle. Draw a curved line from the bottom to the middle of the top. Create the dust cloud in the middle, and then the swirl lines to show motion. An image site for tornado chasers, weather photographers, sky lovers and dreamers. Screen savers of superb tornado photographs from National Geographic. When she was halfway across the room there came a great shriek from the wind, and the house shook so hard that she lost her footing and sat down suddenly upon the floor. Then a strange thing happened. The house whirled around two or three times and rose slowly through the air. Dorothy felt as if she were going up in a balloon. by L. Frank Baum.